A fraudster who posed as an American general serving in Afghanistan conned two women out of more than £300,000 in just six months in what detectives believe was a multi-million-pound global scam. The conman used images of real-life US soldiers to befriend the women over Skype saying he wanted to move to the UK to marry them. He posed as “General James Krulak” and “General James Raul” and persuaded them to help transfer his $8.5 million (£5.4 million) retirement fund — a “box of treasure” from a family in Afghanistan. Today Scotland Yard issued an appeal, saying it has identified two other possible victims of the fraudster but fears there may be many more women who have lost money. Detectives from the Yard’s new FALCON cyber crime unit say they have uncovered evidence the con was part of a “sophisticated global network” preying on vulnerable women. Nigerian national Robinson Agbonifoayetan, 32, of Welling, is facing jail after pleading guilty to two counts of fraud by false representation at Isleworth crown court. The court heard how the British victim, in her sixties and living in Ealing, was befriended by a man she believed to be a US general after he contacted her out of the blue on Skype. The man insisted on speaking to her several times a day, paying her countless compliments and confiding in her about tragic family events, like his parents and sister dying in a car crash. Within days he talked of marrying her and introduced the idea of a box containing $8.5million, which he said he had been given by a family after he saved their lives serving in Afghanistan. She also agreed to meet an delivery agent at a rail station who produced a United Nations diplomatic ID card bearing the name Christopher Williams, saying he came from St Lucia — though the card bore the flag of Belgium. Police say this was actually Agbonifoayetan, who was also the fake US general on Skype. The victim used up her life savings, pawned jewellery, sold her car and took out loans to pay the spiralling costs before finally becoming suspicious and going to the police. 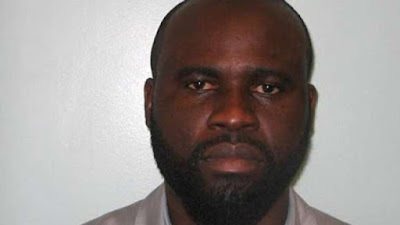 Detectives arrested Agbonifoayetan at Heathrow airport on December 17 2014, as he tried to leave the country on a flight to Nigeria. When police raided his family home in Welling they found a receipt book with details of a second victim in Devon. The woman, in her fifties, was sold a similar story by a “General James Raul” and handed over £22,000. Detectives are now seeking a compensation order to help the victims recoup some of the cash, which was sent to Ghana and Nigeria.